United Way representative explains the 'Over The Edge" event to a Southeast student. 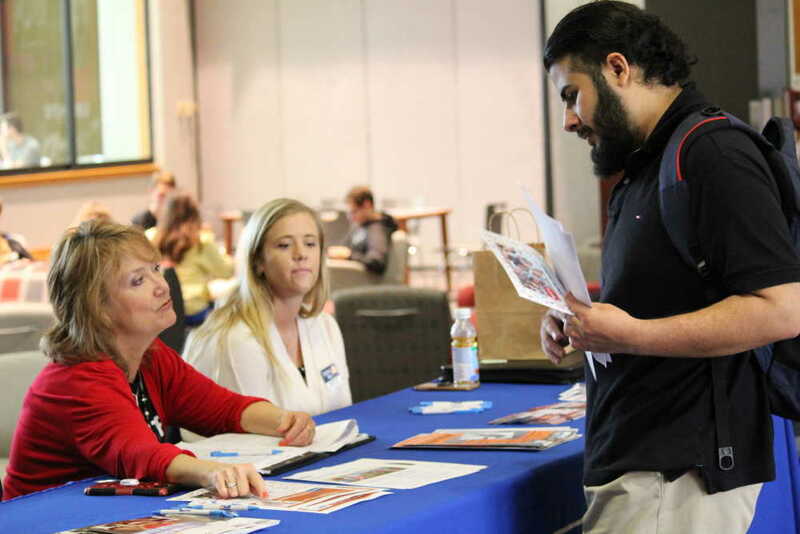 United Way sponsored the first Community Resource Fair April 5 in the University Center. Ten community groups, some partnered or sponsored with United Way, set up information tables during common hour. Organizations such as Care Portal, and Hope for One More, along with United Way partners Community Caring Council, and Big Brothers Big Sisters were some of those offering information. The event was held to help provide information to students about some of the community resources in the Cape Girardeau area. Christy Pogue, the parent education coordinator for Educare, a university-sponsored organization, said these events are good for the university and students because it informs those who might benefit from them. “These are services in the community that not everyone knows about and we feel that it's important to educate the students about what’s in their community, especially if they’re getting ready to graduate from school or looking for a job,” Pogue said. Students can benefit from these organizations as a resource for both a job and in life. Senior Katie Bunselmeyer saw the event on Facebook and thought it was a good way to give back even after she graduates. Leadership United is a program for students at Southeast that focuses on leading through the heart with emphasis on giving back to the community. The students of this club are split into two groups both tasked with creating different community service projects. One of those projects was the Community Resource Fair. 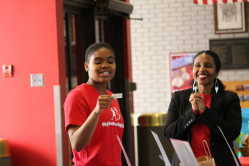 Deidra Evans represent Big Brothers Big Sisters while calling numbers from a ticket for a raffle between the organizations who attended. Member of Leadership United and senior Deidra Evans said they learn about professionalism, communication and interview skills along with other topics such as volunteering. The next event United Way is holding is the Over The Edge fundraiser on May 17, where citizens can repel down the side of Towers South. Funds go toward local community programs and organizations.